Perhaps this may sound strange, but I love cleaning. There’s something about it that’s just very therapeutic and calming to me. It’s often said that our physical surroundings are a reflection of our inner state of mind, and I know that when I’ve properly cleaned and organized my bedroom, kitchen, living room, bathroom, etc., I always feel more mentally alert and on top of things. Part of the reason that I enjoy cleaning so much is that I get to use natural products that smell good and don’t pollute my indoor environment. Just as I savor eating healthy vegan food because I know it’s not only delicious, but that it’s good for me, I love cleaning with natural products because they both smell good and don’t contain harmful chemicals. Before I round up of my favorite cleaning products, I must belabor the imperative of using natural products instead of un-natural products. Because as straightforward as it may seem to many of us that natural products are the way to go, the vast majority of people are fairly oblivious to the hazardous effects of using mainstream cleaning products. Maybe they assume, as I did before I switched to all natural cleaning and beauty care products, that someone somewhere is overseeing the hundreds of chemicals that find their way into the marketplace, and making sure that they’re safe. The cleaning industry – which includes companies such as Clorox, Proctor and Gamble, and Johnson & Johnson – is “self-regulated,” which we can assume is gobbledygook for the health implications of their products aren’t considered, given how toxic the majority of their products are. These companies do not need permission from the FDA to release new products, nor do they need to explicitly state what the ingredients are on the labels. And while it’d be nice to believe that these companies only have our health, happiness, and well-being at heart, the reality is that they only care about the bottom line. Each mainstream cleaning and cosmetic product is basically a toxic soup of chemical ingredients, and we, in addition to ecosystems and wildlife, are the subjects. Here’s a brief overview of the gnarly chemicals commonly found in home cleaning products and why we should be be skeptical. Alkyelpheon ethoxylates (APE’s) – Mimic estrogen and have been implicated in breast cancer. The sneaky thing about these products is that their health effects aren’t immediately obvious. It’d be one thing if people just dropped dead from spraying Febreze, for instance. But the chemicals used in cleaning products don’t work like that. Rather, they’re bioaccumulative – meaning that concentrations build up in the tissues of our body over time. And as a result, it can be almost impossible to link a health problem to any specific chemical or product. To make matters worse, these chemicals go down the drain where they eventually make their way into the ecosystem, contaminating groundwater, rivers, and oceans and negatively impacting wildlife. Our once-pristine planet is gradually becoming a toxic waste dump due to various human activities such as agribusiness and plastic pollution, and toxic residues from cleaning products – referred to hazardous materials or HazMat at waste facilities – are poisoning the air, water, and soil. So the answer, obviously, is to go natural. But before you head over to Whole Foods get some replacements for your toxic cleaning products, buyer beware! So if you can’t trust so-called green, natural, or organic companies to sell un-harmful products, then who can you trust? You can trust yourself, and more specifically you can trust your gut instinct. That’s pretty much it. These days, whenever I consider purchasing a product from a company I haven’t bought from before, I take in their graphic design – is it overly-polished, contrived, or gimmicky? – the copy on their website – does it come across as disingenuous or scammy? and just the overall vibe that I get from them. I try to make sure to read the ingredients and look up any words or terms I haven’t heard before. If I buy something that seems to have a synthetic, un-natural scent then I don’t get it again. I’ve also found the Environmental Working Group (EWG)’s online database of cleaning products to be helpful. It gives specific details about a product’s ingredients and health and environmental concerns relating to them. Finally, I also like to check Gimme the Good Stuff’s glossary. It does a great job of explaining the different toxicants using clear, down-to-earth language. In the U.S. marketplace, cleaning and cosmetic products are innocent until proven guilty. In other words, companies won’t be told by the FDA or USDA to have ingredients removed unless they’ve been unequivocally shown to have negative health effects on us the consumers. The FDA and USDA’s approach to chemicals in household products runs counter to precautionary principle, defined on Dictionary.com as: the precept that an action should not be taken if the consequences are uncertain and potentially dangerous. My perspective is that not only should we avoid chemicals that are potentially dangerous, but that we really don’t even need them in the first place. Most of the ingredients we need for life in general can be found in nature. We’re better off when we eat foods that come directly from the earth; not packaged foods that contain preservatives and chemicals. Similarly, we don’t need all these complicated chemicals to do something as simple as cleaning. There are lots of new cleaning products being marketed as natural today, but as you may have guessed, I find most of them to be not that great. Sometimes the best solutions are those that have stood the test of time. 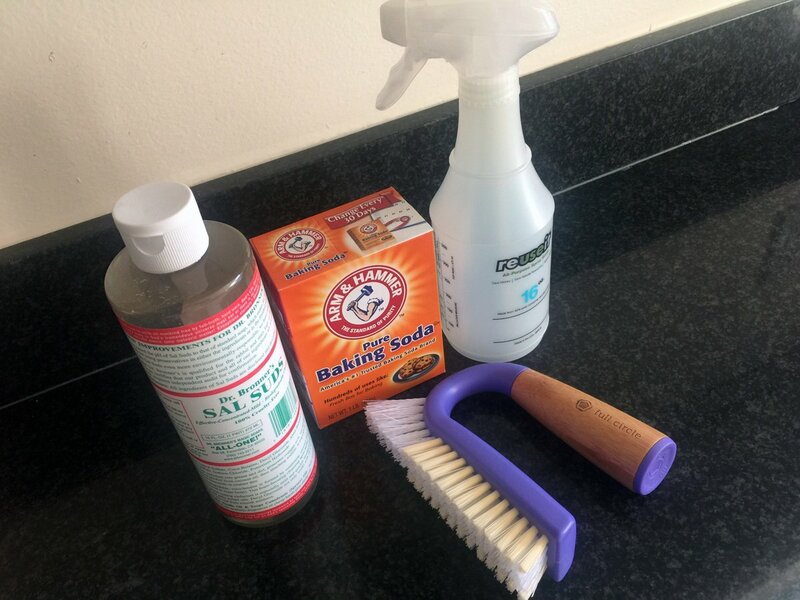 As you’ll see below, I use a few products that are new to the marketplace, but rely primarily on old-school ingredients such as castile soap, vinegar, and baking soda. 1 tablespoon of Dr. Bronner’s liquid castile soap combined with water in a spray bottle. For a more aggressive, antiseptic version, you can add 1 tablespoon of baking soda and 3 drops of tea tree oil. If you’re looking for a pre-made spray, Better Life all-purpose cleaner is a good option. For hand and dish soap, I just use Dr. Bronner’s liquid castile soap. The different aromas, derived from natural essential oils, are super-refreshing and invigorating, and always have the effect of lifting up my mood. Right now, I’m using and loving the peppermint scent, but I switch it up every time I get a new bottle. For dishwasher detergent, I’ve found Better Life dishwasher gel to be the best, because unlike more popular brands of “natural” detergent, it doesn’t include dodgy synthetic cleaning agents, fragrances, or preservatives. I like The Laundress signature detergent, which is mildly scented with lily of the valley, jasmine, sandalwood, and citrus. When I’m running low on laundry detergent, I’ll just mix ½ cup Dr. Bronner’s liquid castile soap with ½ cup white vinegar and that also does the trick. I don’t normally use a fabric softener, but when I do, I’ll break out The Laundress fabric conditioner. For cleaning my bathroom, I use my own special antiseptic solution: 1 tablespoon of Dr. Bronner’s liquid castile soap; 1 tablespoon of baking soda; 3 drops of tea tree oil; and water. I just combine the three ingredients in spray bottle and shake it vigorously. It’s then ready to go! I scrub the tiles of my shower with generous sprays of my disinfectant formula and a Grunge Buster brush, along with copious amounts of water. For a toilet bowl cleaner, I mix 2 tablespoons of Dr. Bronner’s liquid castile soap, 2 tablespoons of baking soda, 8 drops of tea tree oil, and 1 cup of water in a mason jar. I first shake the concoction, then pour most of it in the toilet bowl, scrub it with the brush, flush, then pour in the rest, scrub again and flush. Here’s a glossary of the ingredients I use in my DIY solutions. I always make sure I have these on hand. White vinegar – White vinegar can serve as a cleaning product for many different purposes – from getting dirt and germs off of vegetables to removing mildew on shower heads to deodorizing your closet. I use it for laundry, along with Dr. Bronner’s liquid castile soap, as well as for when I need to soak a particular item. Liquid castile soap – This is the closest thing you find to straight up soap. It’s derived from vegetable oil, rather than synthetic detergents. My favorite brand is Dr. Bronner’s 18-in-1 liquid castile soap, which is a blend of coconut, olive, hemp, sustainably-sourced palm kernel, and jojoba oils. I use it for most of my cleaning needs including: washing my hands, washing the dishes, cleaning out my water canteens, and doing my laundry. Castile soap can also be combined with white vinegar, baking soda, and / or tea tree oil, along with some water to create a powerful all-purpose spray. Dr. Bronner’s is the only green cleaning product company that I trust implicitly. A certified B corporation, meaning that it’s passed rigorous standards for environmental and social policies, Dr. Bronner’s sources only organic ingredients from Fair Trade alliances, while providing help and support to its supply chain communities. The president of Dr. Bronner’s, David Bronner, is a long-time vegan so he gets major points in my book for that alone. Baking soda – Also known as sodium bicarbonate, baking soda is a salt that works as a strong but natural and gentle cleanser, foaming agent, and deodorizer. I find that it adds more power to my DIY formulas. Tea tree oil – Tea tree oil can be an effective antiseptic cleaning agent, and is a good oil to have on hand anyways, as it helps with all sorts of ailments from minor cuts to dandruff. It’s also a great scent to diffuse in your home for a fresh, crisp scent that’s evocative of the woods. For cleaning purposes, mix 2 teaspoons of tea tree oil with 2 of cups water, and you’ve got yourself an outdoorsy-smelling anti-septic cleaner! I also like to add 1 tablespoon of baking soda and 1 tablespoon of Dr. Bronner’s liquid castile soap. Far from being cleaning tools, sponges are actually the dirtiest and most difficult to clean objects in the kitchen according to microbiologists. Their moist, porous surface is an ideal place for bacteria to accumulate and breed. I for one had long been wary of sponges because they just had a mildew-y look about them. It turns out that the reason that they look disgusting, is that they are disgusting. They typically contain 10 million bacteria per inch! An NSF International survey of U.S. homes revealed that 86% of sponges had yeast and mold, and 18% had staph bacteria, which can cause skin and respiratory infections, as well as food poisoning. What’s more, sponges are made with plastic, which is not biodegradable. I use dishcloths that are made from a blend of bamboo and microfiber. Bamboo is sustainable, fast-drying, and inherently antimicrobial. When I need to really scrub pots, pans, etc. I use a Full Circle Be Good dish brush, which is made from bamboo and recycled plastic. Plastic garbage bags typically go into in landfills, where they don’t biodegrade, though they do eventually fragment and coalesce with rainwater to create leachate, which poisons soil, groundwater, and streams. Instead of using plastic bags in the kitchen, I rely on BioBag products. BioBag is a Scandinavian company that makes biodegradable plastic-like bags made from plant starches, vegetable oils, and compostable polymers. For the kitchen, I use the tall kitchen bag, and for the bathroom I use the 3 gallon bags. I try to rely on dish towels as much as possible to clean the kitchen because they have less of an environmental impact, but sometimes paper towels are necessary. In that case, I use Seventh Generation paper towels, made with recycled paper. Light a soy wax candle! I think it’s important that we pause for a moment to note how nice our kitchen, bathroom, bedroom, living room, etc. looks when we’ve done a thorough cleaning of it. To mark that I’m done with my cleaning for the day, I like to light a natural soy wax candle. Candles create a soothing ambiance and signal to me that it’s time to relax and take in all the work that I’ve done.